We study Digital addiction (DA) as an emergent research area and explore a problematic usage of digital media described by being obsessive, excessive, compulsive, impulsive and hasty. We particularly focus on aiding people to adjust their usage style through the use of digital technology itself. This research is led by Prof. Raian Ali and it is a joint effort between the Department of Computing and Informatics and the Department of Psychology in the Faculty of Science and Technology at Bournemouth University. We also have a rich outreach knowledge exchange programme with input from colleagues across external national, European and International academic and professional collaborators. This work has been featured in reports in the Telegraph and Huffington Post and La Stampa and The Naked Scientists and Digital Mindfulness and iGaming Times and Bloomberg Opinion and The Conversation and Tech World. 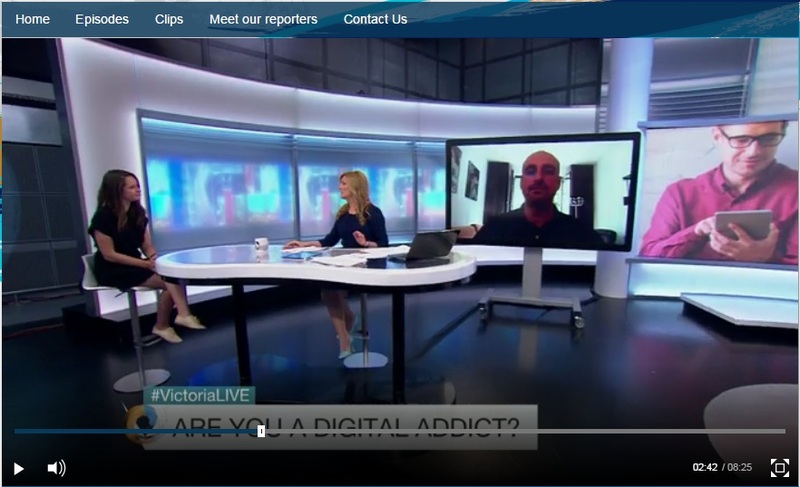 .The team has been interviewed frequently on media including BBC Cambs, ABC Australia and talkRADIO, BBC Solent, Wave 105 and Heart, BBC Two Victoria Derbyshire programme. Why do we study DA? Recent studies demonstrated an association between the use of technology and certain addiction symptoms such as withdrawal symptoms, tolerance to the continuous increase of usage, relapse when trying to reduce or adjust the usage style and mood modification when one is online. Research has also shown that such excessive and obsessive usage and preoccupation about technology are associated with undesirable behaviours such as reduced creativity, anxiety and occasional disconnection from reality. While the wealth of information technology and online connectivity are prominent characteristics of the quality of life, their addictive use may result in a less sustainable and connected society. Governments and societies have started to introduce precautionary procedures to stop Digital Addiction. For example, from 2007 China introduced an anti-online gaming addiction system to restrict players under 18 to spending less than 3 hours a day playing digital games. In the USA, Digital Detox programs are available. The immersive use of technology and presence in the cyberspace can easily lead a person to become unconscious of the time spent, the side-effects of being overly online and the potential risks of taking actions in a hasty style due to a sort of irresistible impulse. Thus, we believe that providing aiding measures such as interactive, real-time and intelligent warning messages and labels are a social responsibility, ethical and professional practice for technology developers at least to raise awareness so that people take an informed decision whether and how to use technology. Our group believe in the power of intelligent and interactive persuasive technology approaches to enable people to take an informed decision about their usage and regulate it in a way that minimizes their concerns, conflicts, relapse, salience and withdrawal symptoms in relation to technology usage. Examples include enabling users modelling their ideal usage and tracking it and the deviation which may eventually happen, enabling people to set up a time limit and a reduction plan which can be then tracked and visualized, offering them designated online platforms for agreeing and enacting their cyber social interactions protocols and habits collectively and other range of persuasive and software-based behaviour change technologies. The requires novel design processes as such technology is not simply a utility software where users know what they want in a certain business but rather an affective computing where the potential side effects, risks, effectiveness and sustainability of the achieved behaviour change are main concerns. Such a software-based intelligent and interactive persuasive intervention is not only about informing the user of the amount of time spent on a digital device. It could be powerful precautionary mechanisms to avoid entering a highly-addictive usage stage. This is most common in the case of games and social networks. For example, the labels can raise self-awareness and also enlighten the user about other activities they can do as an alternative to being online based on their profile and interests. It could be also a mechanism to recover from digital addiction or regulate the usage style and moderate the preoccupation about it. For example, it could enable people to set up a limit, e.g. an amount of time of using a social network or friends to interact with online, and remind them whether and how they are adhering to the limit. Another style of designing such mechanisms would be based on peer groups where peers make a sort of surveillance on each other and put a peer pressure to adhere to a certain usage style. Thus, in contrast to traditional interventions and behaviour change methods, e.g. labels found on tobacco and alcohol, digital media can be designed to include a more intelligent, real-time and interactive incarnation of such method. While tobacco and alcohol cannot tell their “users” to stop, software fortunately can. Online intelligent and interactive mechanisms to combat digital addiction are not one size fits all. People have different preferences on how these mechanisms should be presented to them. Accommodating this diversity and ensuring fitness, effectiveness and sustainability of such solutions are main challenges. For example, people could differ in their preferences in the language style and the content used in the messages and the way they are delivered, e.g. a pop-up, sound alert, change in screen colour, etc. People are also different in how they view digital addiction and it seems there is not a unique measure for defining an addictive usage. The time spent on technology is only one indicator of digital addiction but apparently not enough. How can we measure other facets of digital addiction such as mood modification and preoccupation? The development of intelligent software able to understand users and personalize the interactive intervention so that they fit those users’ context, their perception of technology and its addictive usage and their preferences and values and ensuring the effectiveness and long-lasting effect of such labels are all challenges we still have to address. Majid Altuwairiqi, Emily Arden-Close, Nan Jiang, Georgina Powell, Raian Ali. Problematic Attachment to Social Media: The Psychological States vs. Usage Styles. The IEEE 13th International Conference on Research Challenges in Information Science (RCIS’19). 29-31 May 2019, Brussels, Belgium. Abdulaziz Alblwi, Angelos Stefanidis, Keith Phalp, Raian Ali. Procrastination on Social Networking Sites: Combating by Design. The IEEE 13th International Conference on Research Challenges in Information Science (RCIS’19). 29-31 May 2019, Brussels, Belgium. Sainabou Cham, Abdullah Algashami, John McAlaney, Angelos Stefanidis, Keith Phalp and Raian Ali. Goal Setting for Persuasive Information Systems: Five Reference Checklists. 14th International Conference on Persuasive Technology. Springer LNCS. 9 – 11 April 2019. Limassol, Cyprus. George Drosatos, Fotis Nalbadis, Emily Arden-Close, Victoria Baines, Elvira Bolat, Laura Vuillier, Theodoros Kostoulas, Marcin Budka, Sonia Wasowska, Maris Bonello, Jamie Brown, Tessa Corner, John McAlaney, Keith Phalp and Raian Ali. Enabling Responsible Online Gambling by Real-time Persuasive Technologies. Complex Systems Informatics and Modeling Quarterly, CSIMQ , 17 (2018): 44-68. Manal Aldhayan, Sainabou Cham, Theodoros Kostoulas, Mohamed Basel Almourad, Raian Ali. Online Peer Support Groups to Combat Digital Addiction: User Acceptance and Rejection Factors. WorldCIST’19 – 7th World Conference on Information Systems and Technologies. Springer AISC Series. 16-19 April, 2019. La Toja Island, Spain. Sainabou Cham, Abdullah Algashami, Manal Aldhayan, John McAlaney, Keith Phalp, Mohamed Basel Almourad, Raian Ali. Digital Addiction: Negative Life Experiences and Potential for Technology-Assisted Solutions. WorldCIST’19 – 7th World Conference on Information Systems and Technologies. Springer AISC Series. 16-19 April, 2019. La Toja Island, Spain. John McAlaney, Emily Arden-Close, Raian Ali. Gender Differences in Attitudes towards Prevention and Intervention Messages for Digital Addiction. WorldCIST’19 – 7th World Conference on Information Systems and Technologies. Springer AISC Series. 16-19 April, 2019. La Toja Island, Spain. Majid Altuwairiqi, Theodoros Kostoulas, Georgina Powell, Raian Ali. Problematic Attachment to Social Media: Lived Experience and Emotions. WorldCIST’19 – 7th World Conference on Information Systems and Technologies. Springer AISC Series. 16-19 April, 2019. La Toja Island, Spain. Aarif Alutaybi, John McAlaney, Angelos Stefanidis, Keith Phalp, Raian Ali. Designing Social Networks to Combat Fear Of Missing Out. In the 32nd Human-Computer Interaction Conference (British HCI’18) – Position Papers Track. 02-06 Jul, 2018. Belfast, Northern Ireland. Amen Alrobai. 2018. Engineering social networking to combat digital addiction: the case of online peer groups. Doctorate Thesis (Doctorate). Bournemouth University. Amen Alrobai, Huseyin Dogan, Keith Phalp, Raian Ali. Building Online Platforms for Peer Support Groups as a Persuasive Behavioural Change Technique. The 13th International Conference on Persuasive Technology (Persuasive’18). April 16 – 19, 2018. Waterloo, Canada. George Drosatos, Fotis Nalbadis, Emily Arden-Close, Victoria Baines, Elvira Bolat, Laura Vuillier, Theodoros Kostoulas, Sonia Wasowska, Maris Bonello, Jane Palles, John McAlaney, Keith Phalp and Raian Ali. Empowering Responsible Online Gambling by Real-time Persuasive Information Systems. IEEE Twelfth International Conference on Research Challenges in Information Science (RCIS’18), May 29-31, 2018, Nantes, France. George Drosatos, Fotis Nalmpantis, Victoria Baines, Elvira Bolat, Laura Vuillier, Theodoros Kostoulas, Emily Arden-Close, John McAlaney, Keith Phalp and Raian Ali. A conceptual architecture for empowering responsible online gambling with predictive, real-time, persuasive and interactive intervention. The 13th International Conference on Persuasive Technology (Persuasive’18) – Poster Track. April 16 – 19, 2018. Waterloo, Canada. Amen Alrobai, John McAlaney, Keith Phalp, Raian Ali. Exploring The Risk Factors of Interactive E-health Interventions for Digital Addiction. International Journal of Sociotechnology and Knowledge Development (IJSKD)- IGI-Global. (2016). Amen Alrobai, John McAlaney, Huseyin Dogan, Keith Phalp, Raian Ali. Exploring the Requirements and Design of Persuasive Intervention Technology to Combat Digital Addiction. The 6th International Working Conference on Human-Centred Software Engineering (HCSE’16). August 29th-31th, 2016. Stockholm, Sweden. Amen Alrobai, John McAlaney, Keith Phalp, Raian Ali. Online Peer Groups as a Persuasive Tool to Combat Digital Addiction. The 11th International Conference on Persuasive Technology. PERSUASIVE 2016 (PT-16). Springer LNCS. April 5-7, Salzburg, Austria. Raian Ali, Nan Jiang, Keith Phalp, Sarah Muir, John McAlaney. The Emerging Requirement for Digital Addiction Labels. The 21st International Working Conference on Requirements Engineering: Foundation for Software Quality (REFSQ 2015). Springer LNCS. Essen, Germany. March 2015. Jingjie Jiang, Keith Phalp, Raian Ali. Digital Addiction: Gamification for Precautionary and Recovery Requirements. The 21st International Working Conference on Requirements Engineering: Foundation for Software Quality (REFSQ 2015). Demo and Posters Track. Essen, Germany. March 2015. Raian Ali, John McAlaney, Shamal Faily, Keith Phalp, Vasilios Katos. Mitigating Circumstances in Cybercrime: a Position Paper. The 3rd International Workshop on Cybercrimes and Emerging Web Environments (CEWE’15), co-located with DASC-2015. 26-28 Oct 2015, Liverpool, UK. Amen Alrobai, Keith Phalp, Raian Ali. Digital Addiction: a Requirements Engineering Perspective. The 20th International Working Conference on Requirements Engineering: Foundation for Software Quality (REFSQ 2014). Springer LNCS. Essen, Germany. April 2014.